George Thomson scored Harrogate Town's winner at Dover. 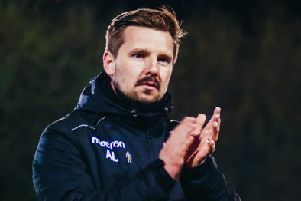 Harrogate Town manager Simon Weaver praised his side’s mental strength after they snatched victory from the jaws of defeat with a 3-2 victory at Dover Athletic. The men from Wetherby Road led until the closing stages courtesy of Mark Beck’s early strike, though two goals in the space of as many minutes saw the game turned on its head. Beck then bagged a second in the 84th minute to level matters at 2-2 before George Thomson wrapped a fine comeback with a stunning stoppage-time finish. “I’m just pleased to come out of it with a really important three points,” Weaver reflected. “The mentality was absolutely superb in terms of finding a way to win. “There’s no doubt we were looking fragile at one point, and actually we looked tired, which is not like us. “It was difficult, but to turn it around speaks volumes about the team spirit. “Of course we can analyse the performance on where we can improve, but sometimes it’s just important to win ugly. The match was just seven minutes old when Jack Emmett got down the right and crossed for Beck to open the scoring. Town remained in front until the 79th minute, Jamie Allen and Jai Reason netting in quick succession to put Dover ahead. Beck’s finish from an Aaron Williams centre levelled matters at 2-2 before Thomson cut in off the left flank and smashed in a screamer to lift his side up to seventh in the National League standings. Elsewhere, former FC Halifax Town striker Scott Boden came back to haunt his old club with the winning goal as the Shaymen lost 1-0 at Chesterfield. It’s now six hours without a goal for Town, who now have only a two-point cushion between them and the bottom four. No goals in five of their last six games tells the story. Farsley Celtic made it three wins on the bounce with a crucial 2-1 triumph over Evo-Stik League Premier Division promotion rivals Nantwich Town at Throstle Nest. Adam Clayton had given Farsley a deserved lead inside 20 minutes, before James Lawrie equalised for the Dabbers in the second half. The visitors missed a host of chances to go ahead and were made to pay as Ben Atkinson struck a late penalty to claim all three points for the Celts. The result leaves third-placed Farsley three points behind leaders Warrington Town with two games in hand and only one point behind second-placed South Shields having played a game less. In Evo-Stik East, second-placed Brighouse Town took advantage of leaders Morpeth Town’s 1-1 draw at Pickering Town to move within four points of top spot following a 3-0 victory over Tadcaster Albion. Thomas Haigh, Aaron Martin and Iwan Heeley were on the scoresheet for Brighouse. Third-placed Pontefract Collieries kept up the pressure with a thumping 5-0 victory at second-bottom Stocksbridge Park Steels. Eli Hey netted an early brace and further goals followed from Nicholas Guest, Vaughan Redford and Jack Greenhough. Ossett United moved above Tadcaster into fourth place thanks to a 1-0 win over Gresley – courtesy of a Tom Greaves penalty. Ryan Blott’s goal helped Pickering Town pick up an excellent 1-1 draw with Morpeth while Frickley Athletic drew 0-0 at Stamford. In the Northern Counties East League Premier Division, a brace from Nash Connolly helped Nostell MW defeat Barton Town 2-0 and move to within three points of second-placed Yorkshire Amateur. Fifth-placed Knaresborough Town eased to a 3-1 win at Athersley Recreation thanks to goals from Stephen Bromley, Daniel Thirkell and Luke Stewart. It was a day to forget for Harrogate Railway who went down 8-0 at Penistone Church while Garforth Town lost 2-1 at home to Worksop Town. In Division One, Selby Town thrashed Rossington Main 5-3 with Jordan Snodin, Joshua Dacre, Joseph Dale, Liam Flanagan and Fraser Hansen all on target.